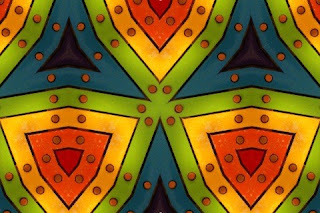 You only have to point the camera at something colorful and tap the screen, image freezes and the result is amazing kaleidoscopic image in your iPhone.You can share it on facebook,twitter,sendvia e-mail or just save it as it is pretty good way to create unique backgrounds for your iPhone. All this is available via KaleidoVid 1.0---new app created by David Barnard of App Cubby and Polar Bear Farm for the crazy price of just $0.99. Truly it sounds a little strange that Two developers making serious apps decided to spend their time on creating something fun little app.Yes it's a little break for springtime! KaleidoVid is a video kaleidoscope that creates beautiful kaleidoscopic images from every day objects using the iPhone's built in camera. The app will take what your phone sees and turn it kaleidoscopy. It is pretty simple like those little cardboard tube kaleidoscopes we all played when we were kids. The combination of mirrors and colored beads can yield amazing geometric patterns when pointed at light sources and it's a great example of the principles of reflection. Now you can have beautiful images created by you and your iPhone.